Shoppers at the Tesco Extra in Rotherham town centre may need to change how they use the car park at the 110,000 sq ft superstore as the retailer intends to introduce restrictions later this month. The national retailer is set to introduce a system that would allow shoppers to continue to park for up to three hours, as is the case now, but only if they spend over £5 in store and validate their parking. Shoppers wanting to use the 600 space car park but not the Tesco store will only be given 30 minutes to head into town before leaving the site. Those wanting to use the car park will still be able to visit the rest of the town centre in their three hours, so long as they spend £5 at Tesco and validate their parking. Tesco said that the measures are being brought in "to improve space availability for our customers." When it opened, the store operated on a 24 hour basis. Opening hours were cut to 6am to midnight last year. The car park currently allows for three hours free parking without the need for any spend in store or validation. The new measures are set to be introduced on February 28. The new "ParkShopReg" system involves parking being validated on the day of visiting the store. This can be done at store using the machines provided or by using an app. A free parking voucher will be printed for customers in store which includes a barcode and voucher code. Drivers will have up until midnight on the day to validate using the app. Details of any financial penalties have not yet been announced. The retailer added: "Customers sometimes struggle to find a parking space when stores are near to town centres, train stations or other places where parking is difficult or expensive. The ParkShopReg Management System links customer stay time with spend in store helping to protect spaces for customers." The £40m store opened in 2014 and includes 66,000 sq ft of retail space with planning permission granted for an additional 36,000 sq ft of floorspace from the old store on Forge Island. 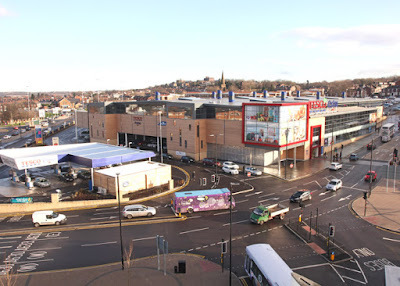 Built on land purchased from Rotherham Council, the authority accepted the provision of free parking at the store as part of the 2011 planning application as it was the same as the arrangements at the old store. It was based on the car park being "made available, free of charge, for use of customers and non-customers for a maximum of two hours." A condition was attached to the approved planning permission which read: "Prior to the development being brought into use, a Car Parking Management Strategy shall be submitted to and approved by the Local Planning Authority and the approved plan shall be implemented throughout the life of the store. The plan shall include details of the availability of 2 hours free parking for customers and non customers of the store. Reason: To limit the availability of free parking and to encourage the use of sustainable transport." So by not allowing 2 hours free parking they are blatantly breaching the terms by which planning for the store was agreed ? I trust that the council will take them to task on this and ensure that Tesco complies with the planning agreement. So, Every Little Helps? More like a cynical move motivated by profit and self-gain. At a time when RMBC are trying to encourage more people to visit the town centre and support local, independently run businesses (e.g. Market traders), this decision seems to fly in the face of this. Like the previous commentator, I hope the council looks into this treats Tesco with the contempt it deserves. I suspect the real reason behind imposing the charges is that the store is not performing in line with what greedy Tesco and it's multi-million pound profits had hoped and they are trying to do everything they can to force shoppers to spend every penny with them. I can't think of any other reason why they would reduce the opening hours and impose charges on what is a largely empty and under-utilised car park. The reasons Tesco have given just don't stack up. Probably RMBC behind move,so visitors to town centre have to use council car parks,therefore giving council income?? I take wheelchair users on Door2Door transport but the buses cannot access the drop off points near the entrance due to height restrictions. People with disabilities have to be dropped off and make their way right across the car park to the entrance. So people with mobility problems have further to walk than able-bodied folks......That makes perfect sense! As someone who works here i can tell you now this is not a profit gain. What it fails to mention is staff also have parking restrictions and on most cases cant find a space when we start at 3pm. Also the current problem of young adults in loud cars being a nusance makes us staff feel unformfortable leaving our cars down where when they use the car park as their personal playground. You wouldnt want your car damaged while shopping would you? No. Please dont jump to conclusions just because money is involved Best move the store has done since it opened. I am appalled at Tesco's decision and hope that planning permission for the reduced parking times will be turned down. If not this will see the further decline in Rotherham town centre shops and especially the market. I can't believe that staff can't find anywhere to park at 3pm. The car park was half empty when we were there on Saturday. I hope that shoppers will vote with their feet and avoid this greedy company. As a collegue working at the store i totally back up tesco decision. unless you people have seen the problem of congestion with your own eyes then you have no reason to judge tesco decision. this procedure is in place already in many diverse areas across the nation and it works. Tesco Are simply taking action for what is a serious concern. if people are shoping at tesco they will easy spend a fiver in store . those spending under £5.00 will not need longer than 30 minutes to shop its that simple. The boy racers use the car park as a racing ground and car parking spaces are full so has become a growing concern getting worst. Tesco should not be allowed to make anyone to have to prove they have spent £5.00 in store as this is against planning permission. if they try to charge anyone for parking they should be taken to court for breaking planning regulations. I use Tesco a lot and the amount of people using the parking for town shopping was getting out of control , it would take me 10 to 15 mins to find a spot sometimes and I hope they still monitor the spaces as well as the amount of times I've seen someone park in child bays ,disabled and even normal cars parking in the electric bays when the shouldn't be for the genuine people .There's many times I've telled staff and store manager that my sister lives in a area where a Tesco is and you pay for the parking upfront and if you visit the store you get refunded for the parking which stops drivers abusing the car park, im glad they have done this as I might start shopping there abit more now as it put me off going cos it was a pain. I thought tesco had in its contract terms allowing free parking when it bought the land from RMBC to allow for community needs as the previous car parking has gone. Where do people park who need to attend My Space for community events once held in the old library?